The other day I was watching a kid’s cooking show on Food Network that I got hooked onto instantly! I swear I can’t start watching shows like that—even one episode or I’m in it until the end to see which kid (or adult) really is the top baker or top chef. Needless to say, I had a marathon of watching this show Kids Baking Championship and the judge was a pastry chef from Brooklyn named Duff Goldman. One of my favorite episodes the kids had to make bagels and I believe they had to make both a savory and sweet bagel. I couldn’t believe the ideas these kids between 9-11 years old came up with! It was pretty incredible. Anyway, Duff said something that I thought was so interesting to me. He grew up in New York and had his fair share of amazing fresh bagels all the time and talked about how the owners of the bagel shops out there are just all about bagels. They eat, breathe, and sleep bagels. They consider themselves neither cook nor baker: just a bagel extraordinaire. Their lives are entirely dedicated to one thing, I think you guessed it: the bagel! So he was quite impressed that some of these little guys could make bagels just as delicious as some of his favorite bagel shops in New York. Bagels are one of those things after finding out how to make them I decided I’d appreciate all the hard work that goes into making them and leave it to the professionals to make for me :) To give you idea of the authentic New York style bagel recipe from food.com you need to get your yeast mixture mixed—then that is supposed to sit for 2 hours, then you add your other stuff and let that sit overnight, then you boil them, bake them, and then toast them if you want them toasted! Geez! We’re talking over 12 hours to make a batch of bagels for that recipe! It sure sounds and looks yummy but I have such a hard time with fish that seem raw like this so when I visited New York I couldn’t bring myself to try it the traditional way. 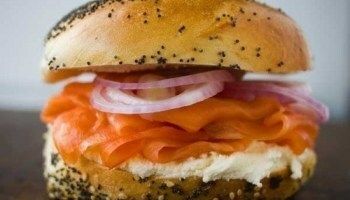 Have any of you ever tried a traditional New York Bagel with lox and a schmear? I’d love to know what you thought! I think I’ll have to be brave one of these days and try it myself!